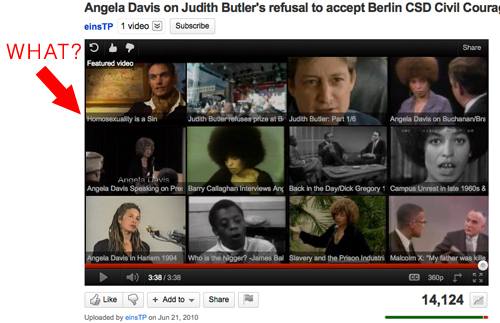 May I ask why in the world is YouTube advertising an Ex-Gay video to me, after watching this clip of Angela Davis speaking about Judith Butler’s refusal to accept a German GLBT award? (An event that had escaped my attention back in the summer of 2010.) It was bad enough that YouTube tried to get me to watch some terrible contemporary horror film trailer after watching clips of The Brood. On Halloween, no less. What is the meaning of this dreadful misunderstanding?! Previous Post Why Demand a Center? Next Post A Nietzschean Yogi?